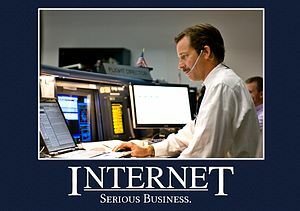 Starting Your Own Internet Business? Are You Ready? What happens when you find out how to set up your own successful Internet business and develop your own Internet marketing plan? I am going to help you answer that question but first let me qualify myself. My name is Thomas Gunter a 46 year plus veteran of the outdoor adverting industry and owner of Billboard Brokers of America, LLC. I have my own Internet marketing plan and website, I am easy to find on the Internet you can look me up on Google by simply placing the words Billboard Broker in the search window.Withthat said let’s move on. No I am not an Internet Guru I and I am not trying to sell you anything. I am a business man that found a better way to make money which I would like to share with you. A way you can also reach out to thousand of people around the world from your website. If I can do this, so can you. Get ready to increase your new-found Internet revenues to a place where there are no limits! The Internet! Cyber space! Here you can go as far as your intelligence and imagination can possibly take you. There are no speed limits so you can take your time or go just as fast as you would like to. It is a great place to build a new business. The goal of this information is to help you get started building your very own Internet business by having the right mindset. Once you have all this in place by all means it time for you to get started! Setting up an Internet website can be quite lucrative and exciting once you know how it is done. Listed below are a few of my step by step details to help you get started. Step 1 – Do your research. Read all the information you can find and seek the information that suits you and your marketing plan best. Study web sites that are successful,their designs continent and marketing techniques. Find techniques and foot prints that will help you to plan and design your own. Set your goals high and become your own success story. Step 2 – Educate yourself. To develop a productive web business necessitates the proper knowledge, this is what separates the winners from the losers in all business. Be sure you learn from someone who has already been successful on the web, listen to what they have to say and then and then decide for yourself what is right for you. To create your online enterprise you need to set up a robust money-making process that will be making you a great cash income. Once you have that technique down you should think about outsourcing techniques of repetitive tasks and focus on increasing the speed of that method so you can grow. Step 4 – Develop a master approach for yourself to definitely what you are going to do and stay with it. Being self-employed requires a lot of self-discipline. This is where the mindset part comes in. Your Internet business will most likely not succeed if you fail to process your goals along with a plan to execute it. In making your new web business lucrative you will have to develop a master plan and provide ample focus and attention to it until it works. Perseverance is one of the main keys to success in any business. To setup your worldwide web business you’ll want to set up essential methods that you will have to adhere to in order to succeed. Most likely that is going to require long hours and a lot of dedication especially in the beginning. If you are planning to start a home based internet business you will need to utilize the enormous power of leveraging to develop your own web business. It is very important you save yourself from on-line misconceptions. Obtaining the desire needed to start-up a home Internet business and having the opportunity to actually do this is two different situations. There are some concerns you should think about before leaving your present job and starting an online business. Be true to yourself before you begin. Ask yourself a few questions before you make a decision. One of the first questions to ask yourself, are you ready to start a home web business? Self-confidence will play a large part in the success of your new business. You will need to believe that your home based business will be successful. What do others think about your self-employment decision? Sometimes one can be over-confident about their ability. Are you ready for self-employment? You need to be very honest with yourself about this. Consider how you work at your current job? Are you one to finish your task at hand regardless of the situation? Do you work just as well at work when your supervisors are not around? Are you willing to work longer hours to achieve you new goals? Are you good at goal setting? These are some of the many questions you need to ask yourself. Have you ever considered instructional classes or workshops about starting up and managing your own business? For individuals who have not run their own business before they may want to consider doing this before they start. You’ll learn about the good, the bad and the ugly part of having your very own small business. It is not for everyone. Are you ready for the real test? If so it is time to get started. You should make sure that you have some type of back up income to help keep you afloat while you seek out your new venture. Be ready for long hours that often generate no immediate income? Working long hours is normal when you are working for yourself. Sometimes you work these long hours with very little or no pay especially in the beginning. In closing I cannot express how important it is to do your research and educate yourself before you begin. Make sure this is something you will enjoy. If you can start out part-time, do it before you give up your day job. Don’t quit your day job until you are sure you are ready. And remember to always have a backup plan. This entry was posted in Advertising, Bill boards, Billboard Advertising, Billboard Advertising Companies, Billboard Property For Lease, Billboard Signs, Billboards 100, Billboards For Sale, LED Billboards, Self Improvement, Uncategorized, Wealth and tagged Business, Dot-com company, Glossary of chess, Google, Home business, Internet, Limited liability company, Marketing, Marketing plan, Opportunities, Small business, Website, World Wide Web by topgunusa. Bookmark the permalink.